Darrel J. McLeod, Mamaskatch: A Cree Coming of Age (Madeira Park: Douglas & McIntyre, 2018). Hardbound, 240 pp., $29.95. 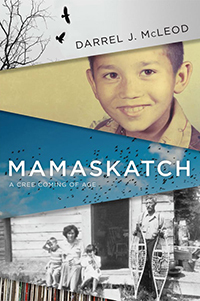 Darrel J. McLeod’s Mamaskatch: A Cree Coming of Age is a memoir I have been waiting for; its raw power of honesty, vulnerability, and truth drew me in from the first page and still holds on to me, even after I’ve finished reading. McLeod immediately drops us into a moment of fear and vulnerability, a world of chaos that never finds solid footing. The book opens with thirteen-year-old Darrel in the unstable home environment created by his mother, Bertha, in which he and his siblings are being raised. We are introduced to the abuses and cruelties that Bertha and her siblings experienced at residential school and the ways they resisted, survived, fought, and sought revenge before escaping for good. Immediately, we see that the merciless abuses suffered by his mother caused devastating consequences that do not allow her to ever fully or continuously function as a mother, or a person, without alcohol. We also come to know that Darrel is playing the role of parent and had recently made the choice to convince his mother to get his younger siblings out of a stable and safe foster home in the hope that, with his help, she could provide a better environment than before. We immediately feel the burden upon him as the oldest sibling left in the house with his mother. We are also introduced to trans* narratives in the book when he describes his older brother and uncle “dressing up as girls,” and we’re informed that the Cree language does not have words for gender or words that are gendered. From here, we are given a collection of memories that begin to paint a larger picture of Darrel’s childhood. When the abuse by Bertha starts to become even more violent and life-threatening, we see Darrel’s younger siblings in and out of foster homes. Darrel moves into further unstable situations with his older sister, Debbie, in Canmore and Calgary. While living with Debbie and her husband, Rory, in Canmore, however, Darrel is sexually abused by Rory and struggles to fully understand the situation and his own budding sexual desires. This abuse haunts and confuses Darrel’s self-worth, identity, sexuality, religion, and relationships for the remainder of the story. Rory’s abuse marks the beginning of Darrel’s awareness of his sexual desire for men. Also, during this time, Darrel plays one of the female leads in a school play where he dresses up as a woman. It marks the first time he has the space to explore his gender. After Debbie leaves him with Rory, Darrel has to decide whether or not to remain by himself with Rory or move in with his mother. After Rory tells him he will never have “kids with Indian blood,” Darrel decides to leave. From his later teenage years and into his early twenties, Darrel struggles with his sexuality. He makes friends with older gay men and sees a world where gay men are out and proud. He attempts to maintain relationships with his Christian friends, who eventually ask him to go through an exorcism to rid him of “the demon of homosexuality.” During this time, his uncle, who becomes Aunty Diane, has undergone a sexual reassignment surgery, and his brother, who becomes Trina, is about to do the same. His Aunty Diane eventually commits suicide, as she is not accepted by her home community, and Trina ends up in rehab. Darrel worries he will “end up like them,” and goes to see a psychiatrist, who, to his surprise, tells him he will be fine. Shortly after, he enters into a closeted long-term relationship with an older white man, where he struggles with his Indigenous identity and his fear of returning to poverty. He works as an operating-room attendant and an orderly, eventually taking university classes in music and science. He hopes to attend medical school, but a series of events, including a break-up, his younger pregnant sister moving in with him as well as his mother (who he eventually evicts), push him to move to Vancouver with his sister Trina. Vancouver is a new start for Darrel. He lives on Davie Street and is able to accept his sexuality in a new way. He eventually enters into a good relationship with a new man, Milan, and resumes his studies at the University of British Columbia. Here he finds the Native community on campus and works to reconnect with his Cree spirituality, culture, and identity. He graduates with a degree in French language and literature and begins to teach Fourth Grade. During this time, he also starts to understand the full extent of the abuse he experienced with Rory, and learns that his mother, who has been living on the streets of Edmonton, is very ill. He goes to visit her and has to begin to face his feelings about the complicated relationship between them. The book ends with the death of his mother and having to drive her body from Edmonton to his hometown of Smith for the burial. It is a painful and unsettling—and yet healing and comforting—experience for him to be back in his home community as an adult. On his way back to Vancouver, he speaks of returning to the waters of Athabasca to cleanse, which signifies the beginning of a period of transformation for him. We see Darrel go through many journeys in his life: of sexual, emotional, and physical abuse; intergenerational impacts of colonialism; death; gender and sexual identity; religious and spiritual paths; relationships; and everything beyond and in between. Throughout, Darrel learns how to survive and navigate from a young age as an Indigenous queer person. This raw, honest, painful story of survival is one we should all read. Kleco kleco (thank you) to Darrel McLeod for sharing this story with us.